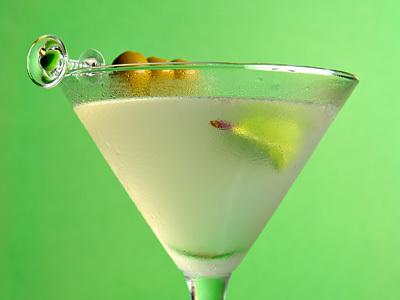 It is a martini with a spicy gingery twist. This refreshing ginger cocktail is made by mixing vodka, ginger syrup, fresh lime juice and fresh mint leaves. It has lot of flavor and packs powerful kick too. Learn how to make zentini and serve something new to your friends in the party you are hosting this holiday season. Add 4-5 mint leaves and fresh lime juice in cocktail shaker and muddle mint leaves. Add ice in cocktail shaker; pour ginger syrup and vodka over ice and shake until fully chilled. Strain and pour drink into chilled cocktail glass. Float couple of mint leaves as garnish and serve. 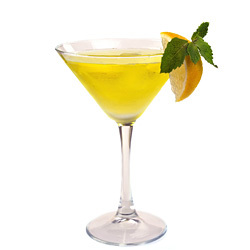 Add 1 oz (30 ml) pineapple juice to add fruit flavor to martini. If you have ginger liqueur, then use that (30 ml / 1 oz) instead of ginger syrup. Use crystallized ginger as a garnish. Taste: Addictive spicy ginger flavor with touch of a citrus and mint. Serving Ideas: Tongue tickling and sense awakening Zentini is a cocktail that can give warm feeling during cold winter nights.